A group of scholars and government officials from the United States and Mexico met at the University of California at Riverside to discuss the cultural significance of preservation of the Spanish missions. The 21 California Missions are actually an extension of a long string of missions that run the length of the Baja California peninsula. Mexico considers the Spanish missions to be an important part of their cultural heritage, and preservation efforts and funded by the Mexican government. 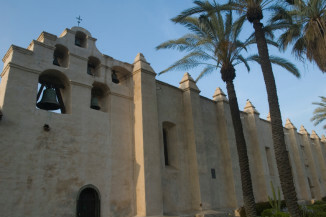 In California, the missions do not receive State or Federal funding, so preservation efforts must be funded by the church or by private donations. The goal of the meeting, which was organized by the UC-Mexico Initiative’s Arts and Cultures Working Group, was to discuss the importance of the missions to local communities today, and explore ideas for coordinating and improving preservation efforts. The meeting also highlighted efforts by Mexico’s National Institute of Anthropology and History (INAH) to designate El Camino Real – the cultural route that connected Baja California with upper California – as a UNESCO World Heritage site.